This 145-mile/233-kilometer route “cuts the corner” of Interstate 84 in northeast Oregon, leading through ranching communities up into the forests and wilderness areas of the Blue Mountains. The Blue Mountains indeed look blue from a distance, a formidable range rising to more than 9,000 feet/2,743 meters and stretching from the Columbia River southeast to the Snake River. A harrowing obstacle for Oregon Trail pioneers, today this route up into the Blues is pure delight, winding past rolling ranchlands, rocky peaks, wild rivers and ample opportunities for recreation. The west end of the byway begins along the Columbia River, where OR-74 leads south from I-84 at Heppner Junction. 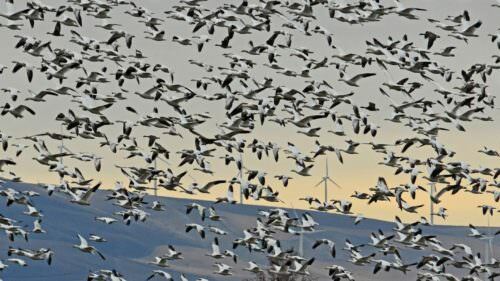 The Willow Creek Wildlife Area provides habitat for upland game birds and waterfowl. 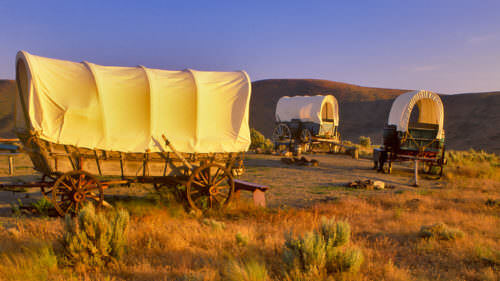 The Oregon Trail passed through what is now Cecil, with thousands upon thousands of pioneer wagons pulled by oxen and mule teams making their way west in the 1850s to settle the Oregon Territory. For a brief detour off the byway, follow the Oregon Trail marker 13 miles/21 kilometers east to an information kiosk at Wells Springs, where deep wagon ruts still furrow the earth. Back on the byway, the route winds along Willow Creek, surrounded by rolling wheat fields and hillsides dotted with livestock. The communities of Ione and Lexington began as sheep stations in the 1800s and still maintain classic examples of frontier architecture. Heppner calls itself the “Gateway to the Blues,” the commercial and recreational center for the nearby Blue Mountains and Umatilla National Forest. The region is a popular destination for hunting, off-highway-vehicle (OHV) riding and, thanks to an elevation of 1,800 feet/ 549 meters that often brings winter snows, snowmobiling and skiing. Closer to town, four streams and the Willow Creek Reservoir provide good fishing. A historic walking tour of downtown Heppner highlights several turn-of-thecentury buildings, including its 1902 bluestone county courthouse. The clock tower, converted to an electronic mechanism in the 1950s, has been restored to its original weighted pendulum, which requires winding every eight days. 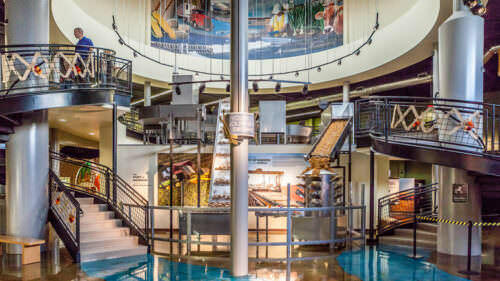 The Morrow County Museum houses a fine collection of pioneer and agricultural artifacts, and chronicles the region’s great flood of 1903, the deadliest natural disaster in Oregon to date. The byway begins to narrow and twist as it departs the highway, winding through hills and canyons on Willow Creek Road and into the 1.4-million-acre Umatilla National Forest. Right at the National Forest border, Cutsforth Park has a campground and cabins for rent as well as equestrian trails, and travelers will find ample trailheads for camping, hiking, horseback riding, OHVs and mountain bikes along FR-53. A half-hour side trip south on FR- 5327 and FR-5316 leads to Potamus Point, offering a magnificent canyon view of the Wild and Scenic North Fork John Day River drainage. Keep a look out for bighorn sheep that were reintroduced into the canyon. The thick forest of fir and pine disappears as the byway descends into a lake basin permanently drained by an ancient earthquake. The town of Ukiah was originally called Camas Prairie for the bright-blue camas that covers the area in spring. Native Americans have long come here to gather camas root, a traditional food staple. Four miles/6.4 kilometers past Ukiah on the byway (FR-53), the Bridge Creek Wildlife Area provides important wintering grounds for Rocky Mountain elk. More than 1,000 elk gather here between December and May to escape deep snows at higher elevations. Nine miles/14.4 kilometers east, an overlook along the route provides another spectacular view into the North Fork John Day drainage and the North Fork John Day Wilderness. Established in 1984, the wilderness area protects the headwaters of the John Day River, the third longest undammed, free-flowing river in the Lower 48. The North Fork John Day Campground marks the east end of the Blue Mountain Scenic Byway. It makes an excellent base for trout and steelhead fishing, or for exploring the Elkhorn Drive Scenic Byway, which intersects here. Order a free Oregon Scenic Byways guide, or view a map of the Blue Mountain Scenic Byway online. Do you have any suggestions for day trips on a motorcycle?